Let’s say you own a restaurant. And let’s say on your menu you have a Reuben sandwich. The Reuben is a classic, which is why it’s on the menus of approximately 98.7% of all restaurants. If I’m in the mood for a Reuben, I can go literally anywhere to get one. In any given city, I’m never more than twelve feet from a joint that serves a Reuben. So why should I choose your establishment? Sure, you can claim you make the best Reuben in town. But nearly everyone makes the exact same claim. You could go a step further and highlight that you make your own corned beef, sauerkraut, and Russian dressing in-house. But these days, lots of places do that as well. And a large percentage of the population either can’t tell the difference, or don’t care enough to go out of their way to seek out a restaurant that does that. But what if you were to do something different? What if you deviated from the standard corned beef, Swiss, kraut, and Russian (or Heaven-forbid, Thousand Island) dressing on rye? What if you made a Reuben with three kinds of meat? Or three kinds of cheese? Or two meats and two cheeses? (Can you say “Bacon Double-Cheese Reuben?”) Or a spicy Reuben, with jalapenos and pepper jack cheese? Or an Italian Reuben with pesto and mozzarella? It would be different. It would be unique. It would make you stand out in a crowded marketplace. Now you probably don’t own a restaurant. But this idea applies to every industry. 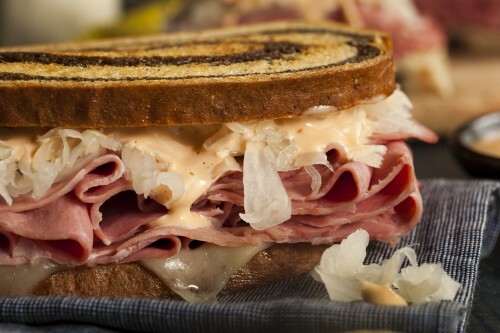 What’s your Reuben sandwich? What do you do that everyone else in your industry also does? And how could you do it differently? The answer could transform your business and radically boost your sales. Oh, and if you do own a restaurant, and you create a sandwich like this, let me know, will you? I’d love to try it!